Update February 2017: You can now get alerts for comments held in moderation by email. 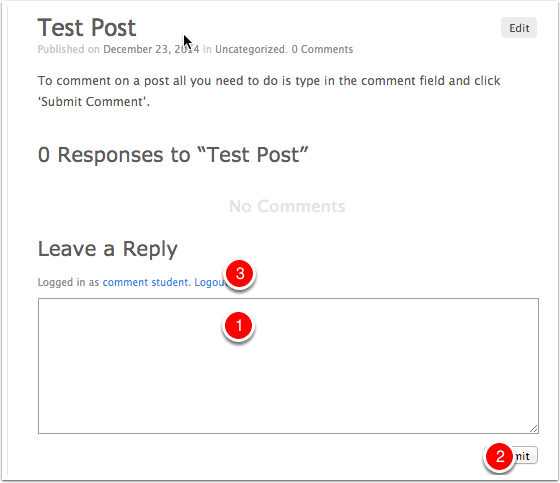 Comments allow your blogs’s readers to have a discussion with you and each other. Comments can be allowed on a Page or Post. The Settings->Discussion page on the dashboard controls comments on Posts generally. Pages have comments turned off by default but they can be activated on a page by page basis. Once you approve a comment, it appears underneath your content. 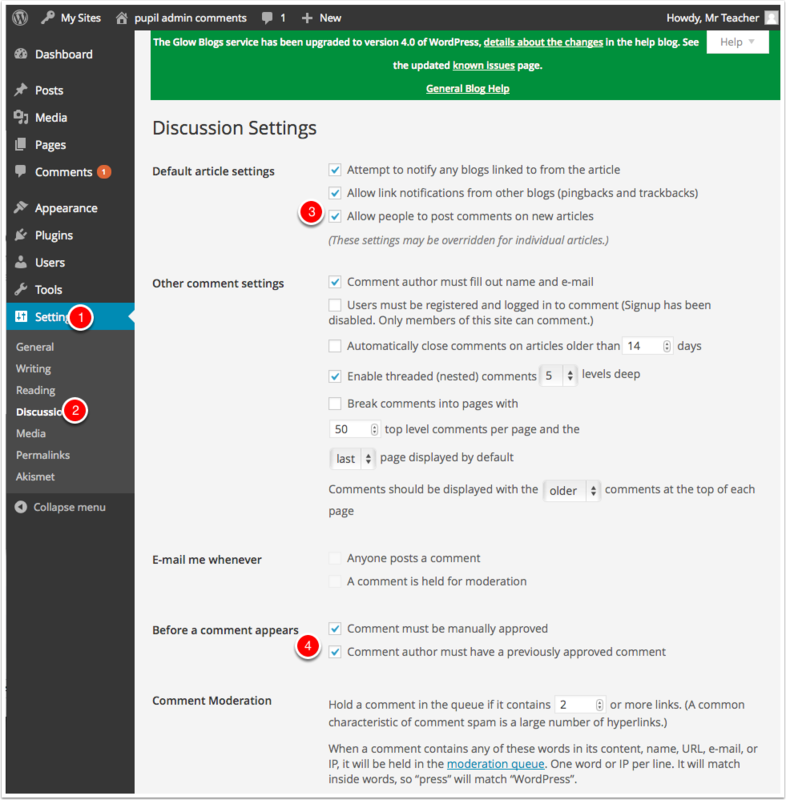 You can allow comments to appear unmoderated or moderate them first. You might have to fill in a name and email if you are not logged into glow . 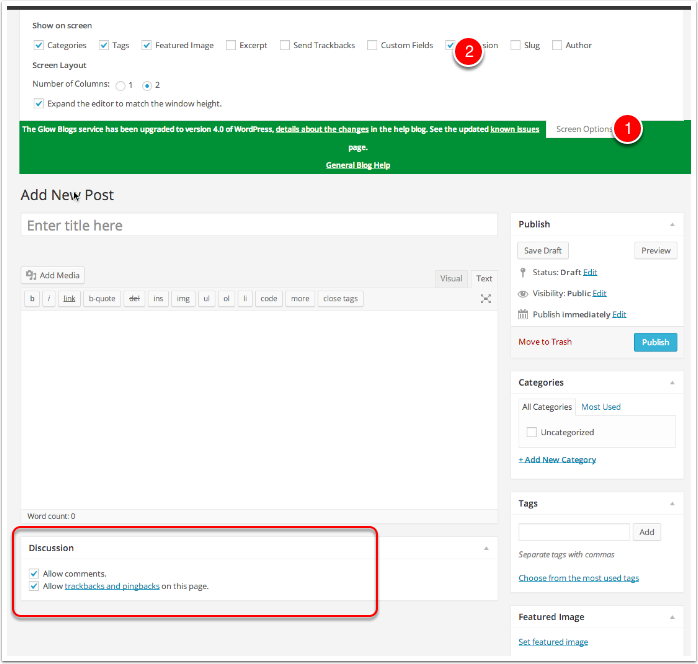 The default settings for commenting on posts can be set from the Discussion screen of the Settings section of the dashboard. To access this screen click on the Settings link in the sidebar  and then the Discussions link. The most important settings are the overall permission to comment  and the moderation . In most cases where you allow comments it is best to check ‘An administrator must always approve the comment‘. Update 2017, you can also check the box to email you when a comment is held for moderation. See this news for more information. After making changes on the setting screen remember to click the ‘Save Changes‘ button at the foot of the page (not visible in the screenshot below). It is important to remember that changes to allow comments will only affect new posts. Pages are not affected. Comments on pages are off by default and need to be activated on a page by page basis. There is a checkbox at the bottom of the post and page editor. You may have to show that section by opening the Screen Options  and ticking discussions . You can also control trackbacks and pingback for each post. These allow link notifications from other blogs. The defaults for new posts and pages are controlled in the discussion settings. If you have allowed comments with moderation you need to moderate comments. Glow blogs differ from standard WordPress in that Glow users with a pupil role cannot see unmoderated comments on a public blog. This is to avoid pupils seeing unsuitable spam comments. On a public blog an Admin who is not a pupil vcan allow pupils to moderate comements if needed. You can access the comments page in the dashboard by clicking on the link on the left navigation . Comments that have not been approved have a yellow background. 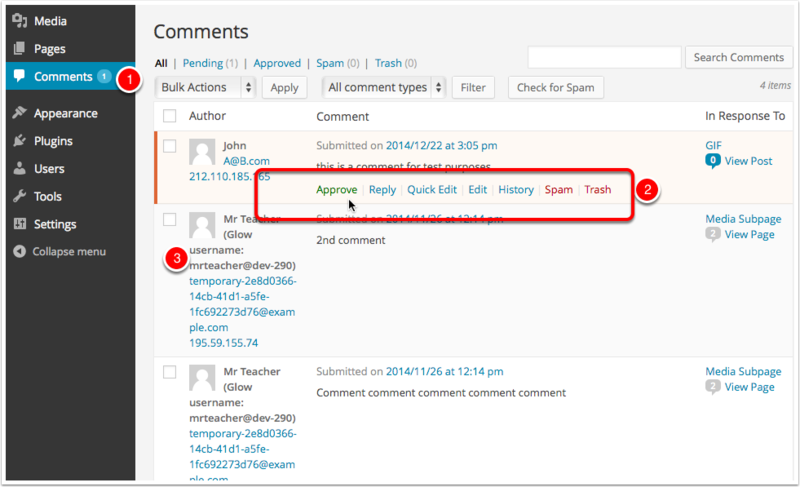 Hovering over a comment will show links to Approve, Reply, Quick Edit, Edit, Spam and Trash. If a comment has already been approve the link will read Unapprove. If a glow user makes a comment on a glow blog while logged into glow the comment will display their display name. Users can change this in their settings. This can be a nick-name so can be used to anomise vunerable pupils. Users with Staff establishment roles will also see the users glow id . You can switch to using Yammer for comments. There is a checkbox at the foot of the Discussions settings page. here is an example: Yammer Comments (You need a glow account to see this ‘Glow Only’ blog. NB commenters will need a Yammer Account.